Oracle Cloud Infrastructure’s next-generation cloud technology was designed to handle performance-intensive workloads, including high-performance computing (HPC) workloads, and has given enterprises an incredible new set of tools for digital innovation. PlasmaENGINE® from FASTDATA.io is the world’s first GPU-native, real-time stream processing software. Using the thousands of cores on a GPU, PlasmaENGINE® processes structured or unstructured streaming data up to three orders of magnitude faster than CPU-based alternatives such as Apache Spark. We at FASTDATA.io built PlasmaENGINE® to provide CTOs, product managers, software developers, data engineers, scientists, and architects with access to highly efficient, real-time data analytics for business intelligence. The goal of PlasmaENGINE® is to give companies the ability to “wow” their customers, accelerate operations, and extract value and revenue opportunities from their data that they previously deemed impossible. To test the limits of PlasmaENGINE®, Oracle enabled FASTDATA.io to access its new bare metal BM.GPU3.8 compute instances, which contain 8x NVIDIA V100 top-of-the-line GPUs. Bare metal GPU servers, without the hypervisor overhead, deliver uncompromising and predictable performance. We tested it by using the haversine benchmark, a SparkSQL query used to calculate and compare the distance between two GPS points on Earth. The benchmark takes gigabytes of CDR rows, each containing the location of both ends of a cellphone call, and then filters those calls based on distance as calculated by the haversine function. This benchmark simulates pipelines common in large telecom companies. The benchmark measures how many records can be processed per second. The following images show the results for Spark running on a CPU compared with PlasmaENGINE® running on GPUs. PlasmaENGINE® processed 1.45 billion rows per second on BM.GPU3.8, compared to Apache Spark’s 12.84 million rows. 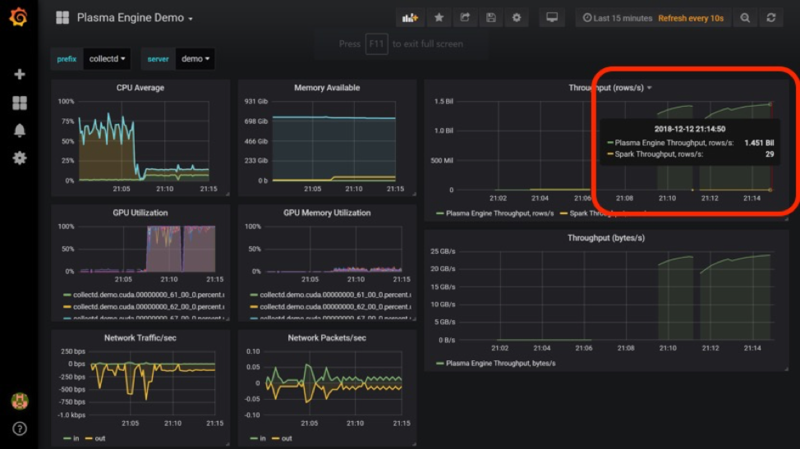 Oracle Cloud Infrastructure harnesses the capabilities of its NVIDIA GPUs—in this case, 8x V100s—and enables PlasmaENGINE® to process data with unparalleled performance. The resulting performance was over two orders of magnitude greater than any CPU-bound stream-processing software on the market today, with the potential to produce even greater results in the future. That type of speed and efficiency allows businesses to save time and money, and to create unforeseen revenue opportunities. To see a PlasmaENGINE® demo, email sales@fastdata.io. To get started with Oracle Cloud for free, visit cloud.oracle.com/tryit. Both solutions working together have the potential to achieve incredible results for your business.